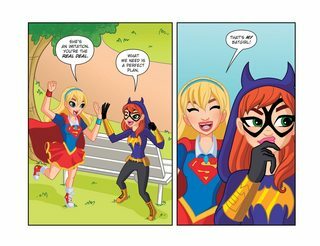 DC Super Hero Girls #6 – Out of the Bottle (2017) : “Painting the Town Red”. The students of Super Hero High leave the school to stop their drawings from wreaking havoc around Metropolis. Meanwhile, Ms. Moone fights to keep her feelings in check. If she can’t, it’ll be disastrous for everyone!